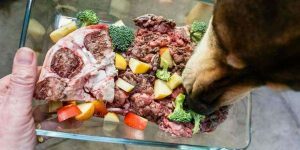 If you have been thinking of feeding your pup a raw diet, you are not alone. A lot of dog owners are realizing that going organic, as opposed to dry kibble, has healthier benefits for their canine friends. However, not everyone knows where to start when switching their pups to raw dog food. Switching to a raw dog food diet can be daunting because you don’t know how to balance the nutrients. Nevertheless, if you can follow these five tips while feeding your puppy, he will definitely grow up to be a healthy fellow. 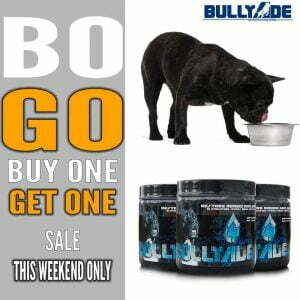 You can also add Bullyade to your dog’s raw food as well. Dogs, especially puppies, rely on calcium for strong bones. Raw bones are a rich source of calcium as well as phosphorus. These two minerals combined should help your pup grow healthy every day. Ensure that a third of his plate is filled with meaty bones. The best sources of bones for your dog include the wings, legs, thighs of chicken. If you are considering turkey bones, only use the neck as other bones are too large for your puppy to chew. The neck and ribs of lamb and goat are great sources of bone meat too. 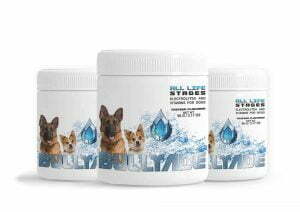 P.s.- Bullyade also helps your pet absorb more calcium out of their diet. Besides calcium, your canine buddy also needs vitamins in his raw dog food diet. The organs of animals are the richest source of multivitamins. Feed him portions of liver, lung, pancreas, kidney, and thymus of animals. At first, he will develop pet diarrhea as he is not used to soft meat. Eventually, he will grow to love the juicy organ pieces. Another way to ensure your pet is getting all the vitamins needed to maintain a healthy life is to provide him with Bullyade. 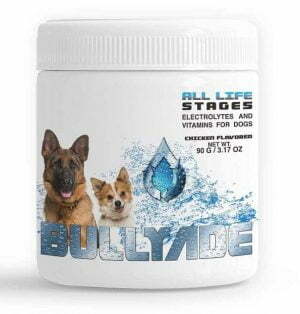 Bullyade has 18 Vitamins and Minerals providing your pet with all the Vitamins they need. Muscle meat is rich in protein. Your pup needs proteins to produce healthy body tissues, hormones, and enzymes. Muscle meat should also take a third of his total food consumption. You should only ensure that it is lean. Beef, pork, and chicken are great choices of muscle meat. If you are feeding him pork, get him meat from the shoulder, ribs, loin, and hinds. For chicken, breast meat and boneless thighs will do. He should also love ground beef, stewing beef, or cheek meat from cows. Dogs need healthy fats but in small portions. Healthy fat helps in developing a healthy nervous and immune system. Healthy fats also promote a healthier skin on your pooch. The only concern here is that you limit the fats in his raw dog food diet. Too much fat may overpower his ability to absorb more minerals and vitamins. As a rule of thumb, healthy fats should make, at most, 20% of your dog’s diet. High-fat meats to avoid include pork belly, chicken or turkey meat with skin, ground beef and duck meat. Instead, feed him lots of lean ground beef, whole fish, rabbit, pork loin, or light meat with no skin. Starch will only add unnecessary calories in your dog’s diet. Dogs don’t digest calories but convert them into body fat. A chubby body won’t do him any good especially if he is a breed that looks healthy with a lean body. So spare him the peas, grains or French fries. A raw dog food diet is healthier compared to commercially sold kibble. You only need to ensure that he is getting plenty of vitamins, minerals, and proteins in his diet. In addition, keep his fat consumption low and never feed him starchy food.